I can't think of anything else than Kingston when it comes to RAM. I'm sure there are other excellent memory modules on the market. The thing is, we only used Kingston RAMs in the past I don't know, many, many years. And we never had a simple problem. Not one. Which is important in this consumer world. With the extra 8GB I would be way out of my budget, so for now I work with 8GB. I haven't tested the memory specifically so far, but haven't have a problem with it either. Cant go wrong with RAM, this kit is nice with its black heat spreaders. Although they do feel tacky and light, its RAM, it works, that's all that matters. Does the job but I will be upgrading to 16gb soon. Or even 32 if i have the patience of saving up enough. 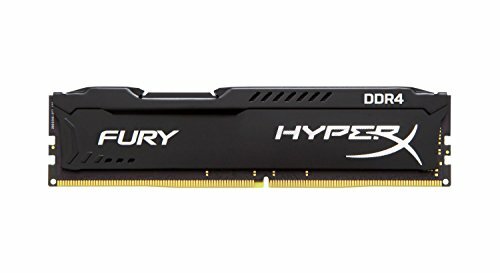 Ram: Simple DDR4 8 gb ram, these things were kind of hard to put in, but I guess I didn't know how much pressure you actually needed to stick them in completely. Basic RAM but a bit expensive when it was bought. Speeds are acceptable and overall provide good performance and reliability. It's ram. It works. Looks good too! As far as quality is concerned, they are great. (And I love the black heat spreaders) I am a fan of Kingston products. They run like advertised. I will buy another 2x4 kit in the future, I just wish I would have went with the 2x8 kit right off the bat. 8GB is running fine for now, but I can see whats coming. Pretty soon you will need 16GB to run AAA games. Does RAM stuff. Does it good. Looks good while doing it.